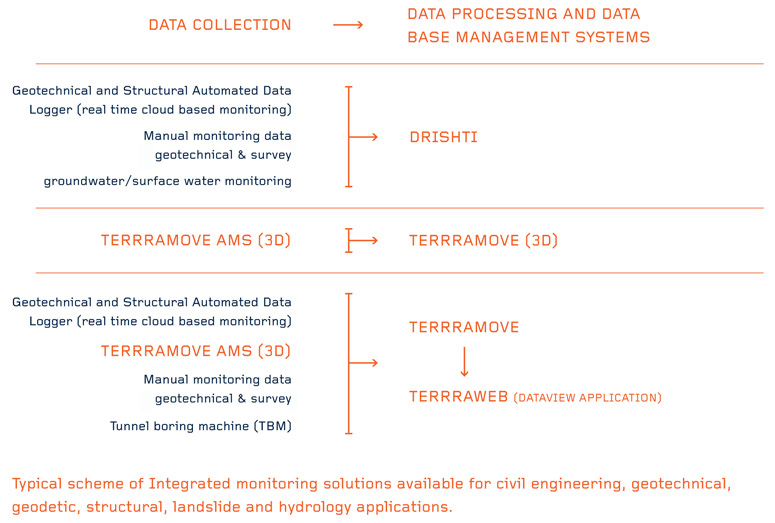 Rite Geosystems offers a complete online cloud based or local access data monitoring solution for monitoring water resources or civil engineering/construction projects. The monitoring system is versatile and can correlate data from structural, geotechnical, geodetic, environmental and Tunnel Boring Machine (TBM) sensors etc. Rite Geosystems offers customized data monitoring solutions to meet specific project requirements. A comprehensive data management system that can store data from different sources. Easy access to meaningful instrumentation data. Data is presented in graphical as well as in numerical format. Results are accessible on tablets and smartphones. Access to sensors on one screen. Instant alerts via SMS or email to authorized personnel. Combined charts in one report (mix deformations, TBM data and water level). Live monitoring display of all the incoming measurements from the TBM. Diagrams from every TBM parameter updated in real time. Creation of diagrams from any combination of parameters and time period. Multiple authorized users at different locations can simultaneously interact with the software through a web-browser to view any real time data/changes, graphs or reports from any project site. Low operational cost and user-friendly tools for day-to-day operations.